As PMD readers, you are rightfully concerned about retirement. There are many different retirement strategies. 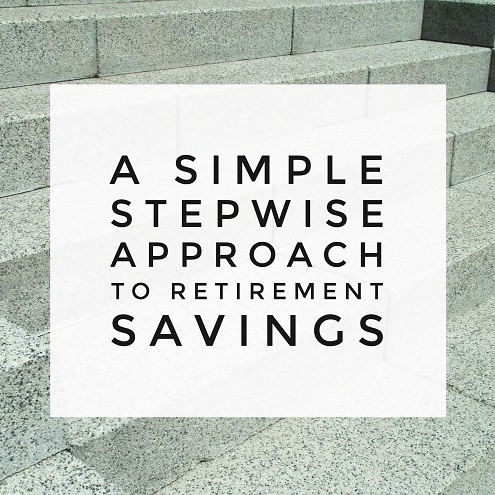 Let me share with you my simple stepwise approach to retirement savings. The best part? You can start following these steps even on a meager resident's salary! This reflects my personal opinion and has not been endorsed by any third party. As always, consult an appropriate financial professional before you make any personal finance decisions. STEP 1: If your employer offers an employer-sponsored plan such as a 401k/403b/457 AND matches contributions, contribute up to the maximum matched in the account. Example: If you make $50,000 a year and your employer matches up to 4% of your income in a 401k, then you should put up to 4% of $50,000 = $2,000 into the 401k. If your employer does not match contributions, start with STEP 2. Some of you may benefit from both the options of a 401k or 403b AND a 457 plan, you're in luck! You will be eligible to contribute up to $18,000 for the 401k or 403b and another $18,000 for the 457 plan if you're under 50 years old ($24,000/year for each if you are 50 years or older). STEP 2: If you still have money to save after STEP 1 or if your employer-sponsored plan does not match, start a ROTH IRA and contribute up to the maximum allowed ($5,500/year if you're under 50, $6,500/year if you're 50 or older). If you make too much to directly contribute to a ROTH IRA, congratulations! That's what I call a First World Problem. But you can still benefit from the tax advantages of a ROTH IRA - see Backdoor ROTH IRA. STEP 3: If you still have money to save after STEP 2, return to STEP 1 and max out your 401k/403b/457 contributions (currently up to $18,000/year if you are under 50 years old, $24,000/year if you are 50 years or older). STEP 4: If you still have money to save after STEP 3, first thing you should do is pat yourself on the back - you're a GREAT saver! Then make sure you're signed up for a High-deductible Health Plan (HDHP) and start an Health Savings Account (HSA). Current contribution limits are $3,350/year (single) or $6,650/year (family) with an extra $1,000/yr catch-up contribution allowed if you're over 55. The best benefit about HSAs is that unlike Flexible Spending Accounts (FSA), the funds roll over year to year if not spent. The contributions are tax-deductible. You can use funds at any time for qualified medical expenses. After age 65, you can treat it just like a 401(k) or IRA. STEP 5: If you still got money left to save after STEP 4, which means you've already stashed away a minimum of $26,850 ($44,850 if you have both a 401k/403b and a 457) towards your retirement this year, YOU ARE MY HERO! The next thing to consider would be a 529 College Savings Plan for your children if you have any. Of course this isn't a retirement plan for yourself in the traditional sense. But if your kids are college-educated, they are more likely to have a better-paying job and less likely to depend on you for financial support - indirectly benefiting you in your retirement. *5% = average annual return for US Treasury bonds; 9.6% = average annual return for S&P500; Total portfolio balance by Bankrate Return on Investment Calculator. The cherry on top - all of it is tax-advantaged! Thoughts and comments? Reach out to me at http://futureproofmd.com/.